How Does Termite Colony Baiting Work? Do Termites Feed All Year Long ? Is Slower or Faster Control Better ? When Is Termite Colony Elimination Complete ? For over 75 years the standard subterranean termite control method has been to place a pesticide material (termiticide) into the soil under and around a structure to create a chemical barrier to protect the structure from subterranean termite attack. As long as the pesticide remained effective, the structure would be protected from subterranean termite attack. The chemical barrier method was especially effective with some of the longer lasting termite pesticides such as Chlordane. These long lasting termite pesticides are no longer available and have been banned in most cases. Since the currently available chemical barrier pesticides are very short lived, the concept of using a chemical barrier treatment as a the sole means of controlling subterranean termites has become a thing of the past and no longer recommended by most Universities. The technology to kill termites using baits is now widely available. Instead of injecting chemicals into the soil which will only last a few years and potentially contaminate the environment, termite baits are placed directly into the ground around the outside of a structure. Termite baiting is simple and can also be used as a preventive measure to detect termites before they become a problem. Termite baiting allows termite control in situations where the structure is untreatable with soil termiticides, there is concern about pesticide use and/or in structures where soil treatments have failed. How Does Termite Colony Baiting Work ? Termite baiting works by killing the workers in the termite colony. When the worker termites have been eliminated, the colony is starved of food and goes into a suppression phase or "decline". The reproductives, queens and soldiers die of starvation because they cannot feed themselves. When the queens and reproductives cannot eat because there are no workers to feed them, they die and the termite colony starves and is virtually eliminated. In order to establish a feeding connection with the termite colony, the scout termites have to locate a food source and the worker termites must feed on it. Termites eat wood and cellulose, nothing else. In the early stages of the pre-baiting process, the termite scouts or foragers will find the bait stations and "tag" them with a "pheromone" which is a scent trail for the worker termites to follow. Next, the worker termites will follow the pheromone trail established by the scout termites and begin feeding. This process establishes the feeding cycle with the termite colony. 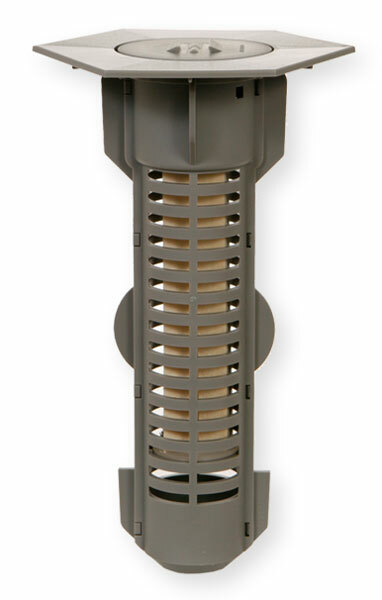 Termite detector stations - often called monitors or just termite bait stations, are specifically engineered to encourage termite feeding and to establish a feeding connection with the termite colony. It has been said that termite detector stations are "windows" to the termite colony. It is important that a solid feeding connection be established in an area where the termites can continually feed without disturbing them. That is the reason that Termite detector stations were developed. Termite detector stations only contain wood. This wood is called detection wood or "interception" wood. It only serves to establish a feeding cycle with the scout and worker termites so that a toxicant can later be used. When a solid feeding connection has been established with the worker termites, the wood can be replaced with a toxic substance that the termites cannot detect, which kills them. When the worker termites die, the colony cannot feed itself, so the termite population slowly starves, dies and the colony eventually crashes. There are several different bait station designs pictured to the left. They are all equally capable of establishing a termite feeding cycle. Ease of use is what is important. After the worker termites have begun feeding and a solid connection is established through the worker termites with the colony, a growth hormone is placed inside the feeding station. The termites are continually fed this hormone until the feeding stops. The length of the feeding cycle and the amount of hormone used depends on the termite population and the size of the colony(s). When enough worker termites have been killed 2 things happen. First, the delivery of outside food sources to the colony is eliminated and second, the colony depletes its internal food sources. This causes the queens, kings, soldiers and reproductives within the colony to slowly starve. The worker termites directly feed the soldiers and the queens. Without the worker termites, the colony cannot feed itself, and will soon exhaust it's food supply. When all food sources have been depleted, the colony begins its decline. This is the goal of termite baiting. Termite baiting is really a simple process, but can be confusing since there are so many bait products to choose from. The bottom line is that all termite bait systems work. Some take longer than others to achieve control. Hexaflumuron (Hex Pro (Sentricon), Shatter, Terminate) and Diflubensuron (Advance) come from a class of chemicals known as Chitin "kite~en" Inhibitors. Chitin Inhibitors work by not allowing the immature worker termites to molt. As a result of not being able to molt, the immature termites die prematurely. This process has a gradual effect on the colony, and as the older more mature worker termites die, they are not replaced. The entire colony is effected because it's the worker termites that feed and nourish the colony. Without them, the colony cannot survive. Chitin is a hormone that immature worker termites secrete to allow them to molt or shed their outer body covering (exoskeleton). The chitin inhibitors contained in termite baits such as Shatter, stop the formation of chitin in the termite. Without the presence of Chitin in the termites body, it cannot molt. It is almost like being strapped in a "Straight Jacket" and not being able to get it. When the effect termites cannot molt, they soon die. Chitin Inhibitors also cause the disruption of the termite social behavior. Termites affected by chitin inhibitors turn a chalky white appearance. When worker termites feed on Chitin Inhibitors, only the immature worker termites are affected. That's because workers, soldiers, reproductives and the queens are already mature. Only about 20% of the colony actually consists of immature workers. That means only 20% of the colony is affected by the action of the chitin inhibitors, 80% of the colony is not affected and must die of old age before any long term effects are seen. Worker termites have been known to live relatively long lives, some up to 5 or 6 years. Worker termites molt an average of 5-7 times during the maturing process. Once mature they can live up to 5 or 6 years. So it could be said the effects by the Chitin Inhibitors on termite colonies could take longer than 5 or 6 years. The time to termite colony death using Chitin Inhibitors is directly related to how much bait is consumed. In most cases, and with an average termite colony of 50,000 or less termites, colony suppression is achieved with as little as 1 tube of bait being consumed, and colony elimination occurring with 2-3 tubes of bait being consumed. The entire length of time this takes to occur can be in a little as 1 season in warmer climates, or several years in colder climates or where termites are not aggressively consuming the termite bait. Sulfluramid (Firstline) which is no longer available, and Sodium Borate (Timbor and BoraCare) come from a class of chemicals known as Metabolic Inhibitors. MI's work by not allowing the termites to convert food to energy. In essence once effected by the MI, the termites slowly starve to death. It has been said that termites die on a full stomach with Metabolic Inhibitors. In essence MI's are stomach poisons killing the termites in 60 - 90 days. Sulflurimid is a very slow acting poison that is thought to actually kill the tiny protozoa in the worker termites gut. This tiny protozoa converts the wood that the termite eats into a source of sugar. The termite then excretes a wood pellet (frass). When the protozoa dies, the worker termite, not being able to digest it's food, dies of starvation. Sodium Borate works basically the same way that Sulflurimid works. Sodium Borate is commercially available also as Timbor. Timbor is a white powder formulation that can be easily mixed with water and sprayed on infested lumber, etc. Sodium Borate has not achieved the same popularity that Sulflurimid has as far as termite baiting in the pest control industry. It has always been considered more of a "natural" alternative to traditional pesticides since it is basically a naturally occurring mineral mined out of the ground by US Borax in Death Valley, California. Metabolic Inhibitors can potentially effect have a much more profound effect on the termite colony compared to Chitin Inhibitors. Unlike Chitin Inhibitors, Metabolic Inhibitors will kill all termites that feed on it. No. Termites are cold blooded (poikilothermic) animals. Low temperatures can substantially reduce or stop their activity close to the earths surface during certain periods of time during the year. For this reason, if the temperature falls low enough, termites may cease to feed in bait stations or the onset of feeding in bait stations may be delayed until temperatures have stayed above a certain level for long enough period of time. Generally speaking, termite activity will be reduced in the bait stations during those times of the year during which the average mean daily temperature is below 50 degrees F. Exceptions to this are areas inside of structures where the temperature is raised due to heating, sunlight, etc. Termites can be active all year long indoors, but outdoors, termites generally are most active during the late spring and summer months. Does this mean you should wait to start baiting until the spring or summer ? No. When the bait stations are installed into the ground, that area is disturbed. The bait station must become a natural part of the environment before the termites will find it. Soil disturbances can repel termites. Again, it generally takes a few months for the termites to find the stations and feed on them. Termite baiting is a slow process, you can't speed it up. Most subterranean termite feeding occurs in the first 8 - 12 inches of soil. When the soil down to a depth of about 12 inches is 50f or higher, termites will feed. Optimal feeding occurs when the soil temperature is above 70f and below 90f. Soil temperatures above 90f are not conducive to termite activity and very low soil tempertures aren't either. When purchasing a professionally installed termite baiting system, these factors need to be considered. The case for doing your own termite baiting makes sense when you realize that paying for an entire year of service is greatly reduced to only a few months of potential activity in colder climates. This "window" of termite activity when the soil temperatures are favorable may be only late spring and summer in some areas of the USA. Professional installation prices for most termite baiting systems are generally figured by the linear foot measurement around the outside perimeter of the structure. An average price per linear foot can be as high as $12.00 per linear foot depending on the pest company and the region of the Country (USA). An example of a Termite baiting treatment price for a 2000 sq. ft. home that is approximately 200 linear feet based on an average price of around $8.00 per linear foot would be $1600.00 for the first year and around $400.00 per year thereafter. That means you are paying $400.00 per year whether termites are feeding or not. Calculate all the costs together and you can easily spend thousands for a professional termite baiting service. An easy way to figure your per station cost is to take the total first year cost and divide the number of stations into it. If your estimate is $1600.00 and you are getting 20 stations, then your cost per station for the first year is $80.00. Your cost per station over an 8 year period is $210.00. If these prices sound a little high, you might want to check out the Hex Pro Termite Baiting System. The Hex Pro Termite Baiting System is the "Original" Sentricon Termite Baiting System that only Authorized Sentricon companies can install. The only difference is that the Hex Pro Termite Stations are gray and have a "Hex" shaped lid for retail purchase. The cost for a Sentricon system professionally installed? around $1,200 for the first year and $300 per year afterwards. Compared to the cost of Hex Pro, which is less than $350.00 and no annual fee. Of course, you have to do it yourself, but when the average Sentricon installation time is 45 minutes or less, the savings can be tremendous. Is Slower or Faster Termite Control Better ? A widely held opinion in the pest control industry is that termite baiting needs to be a slow process, and chitin inhibitors work slowly enough so that they "work through" the termite colony. The problem is that chitin inhibitors tend to work so slowly that the advantage of using a chemical treatment for immediate relief becomes too great to not consider. However, Dow Agrosciences has over 300 independent field tests that confirm that Termite Baiting works. It works so well, that in many cases, there is no additional need for any chemical treatment - even in homes that have existing termite infestations. It just takes some time for the termites to find the stations and begin feeding. One well known National Pest Control Company that uses Sentricon states in their termite baiting contract that the guarantee they provide begins 6 months - "Repair Effective Date" after the date of installation and continues for a period of 24 months. After 24 months they may at their sole discretion elect to provide a chemical treatment and give you the option to cancel your termite baiting contract. If you choose to pay the enormous fees that this company charges for termite baiting, you may end up getting a spot treatment to control the termites and a cancelled termite baiting contract after 2 years. Plus they will remove your bait stations as provided in their contract. If termite baiting takes 2+ years to complete, what are you really getting for your money ? 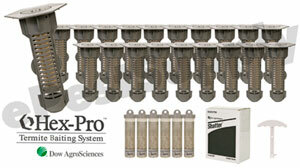 You would be better off buying stock in this company and buying your own termite baiting system and doing it yourself. Termite colony elimination in real life situations is difficult to prove unless the subterranean termite colony can be located and dug up. That is because subterranean termite colonies are too well hidden, usually deep in the ground. 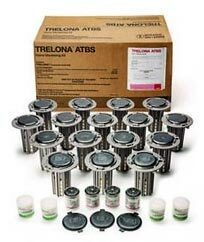 Dow Agrosciences contends that above ground Termite colonies in Japan and Australia were killed using the Sentricon System. Dr. Brian Forschler of Louisiana State University confirmed that termite colony elimination occurred by using several different bait materials including Sulfluramid (Terminate and Firstline) in controlled settings where termites were confined to tree stumps in swamps in Louisiana. Sentricon and Advance both use what is called the "standard of proof" when determining termite colony elimination. The standard of proof is basically this - when the termites have been feeding for a sustained period of 6 months, and they have consumed at least 128 grams of chitin inhibitors and the feeding stops for at least 6 months, and no further feeding continues, and there are no signs of termite activity inside or around the structure, then colony elimination is assumed to have occurred. Even if total colony elimination does not occur, termite bait tests in field sites have resulted in substantially reduced termite populations. This is called "termite population decline". In laboratory tests, the termites are confined to a given area normally inside a small plastic swimming pool or aquarium and given only 1 type of wood to feed on. This limits their choices of food and forces them to feed on the termite bait and they soon die as a result. In the field or the "real world", termites live many feet down in the ground, commonly in the roots of buried tree stumps - and forage for many different sources of wood. They have a selection of different food sources. If the termites do not like a particular wood, they go somewhere else - following the scout termites "recruit" pheromone trail and feed on other wood sources. Because of this random feeding behavior, it is impossible to say with any amount of certainty that a termite colony has been eliminated simply because they stop feeding on the termite bait. With any termite bait toxicant, a certain amount has to be consumed before lethal effects on the colony can even be considered. In cases where only a small amount of feeding as occurred, effects on the colony are often insignificant. The bottom line is that if the termites find and consume all of the toxicant bait, then some control will be achieved. If you prefer to do it yourself, it may take some experimentation and a little bit of hard work, but after it's all said and done, you will know more about your termite infestation than any pest company could ever know (or would spend the time to find out), and you could potentially save yourself a few thousand dollars in the process. Combined Kit Savings - $30.00! * Sentricon is a registered trademark of Corteva Agrosciences LLC. Corteva Agrosciences LLC. is not affiliated with ePestSupply.com and is not responsible for any statements made herein. The Products Mentioned On These Pages Are the Exclusive Property of The Companies Mentioned. No Intention Has Been Made To Violate Any Trademarks or Copyrights. The Information Provided Is The Opinion of ePestSupply.com and is Intended For Informational Purposes Only. Thanks To Texas A&M University, Dr. Roger Gold, Louisiana State University, Dr. Brian Forschler, Spectrum Brands, Ensystex.